The cupcake business has been the latest trend and hype across New York, London and Toronto so what better flavour to sweeten your brushes! 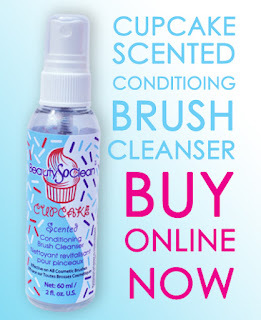 The sanitizer leaves your brushes with a conditioned fresh out of the oven goodness scent. Beautysoclean is the only product on the market that effectively cleans, rejuvenates and removes bacteria! Clean brushes keep your skin pimple free and makes for a fresh smooth makeup application! Check out beautysoclean.com for more product details!